Modi has made strides on a geoeconomic vision, but India still lacks a clear geopolitical strategy. On May 26, the BJP government led by Prime Minister Narendra Modi will complete three years in office in India. This is a good time to evaluate the performance of the government including its foreign policy – just after it has completed half its tenure, and just before it starts gearing up for the next general election. The Modi government’s achievements need to be seen in light of the fact that traditionally New Delhi has never publicly asserted – and arguably, never set for itself – the hierarchy of long-, medium-, and short-term goals of foreign policy and the instruments to achieve these. Occasionally, some governments have laid down strategy – for example, PV Narsimha Rao’s “Look East” Policy, IK Gujral’s “Gujral Doctrine,” or AB Vajpayee’s vision on nuclear policy – but an Indian “grand strategy” has remained conspicuous for its absence. Consequently, Indian foreign policy has often been reactive. Even the Modi government’s foreign policy was not always proactive during its first year in office. Over time, however, the Modi government has captured the imperatives of geoeconomics and begun laying down a strategic geoeconomic vision for India. While any clear statement of goals and instruments is still absent, the strategic vision can be discerned from some of the Modi government’s policy initiatives. This vision is rooted in India’s concerns over trade, energy security, and the “Make in India” initiative. 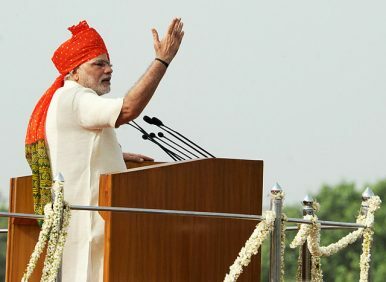 One important pillar of Modi’s foreign policy geoeconomics is the policy of “neighborhood first.” Since the unprecedented invitation by Modi for leaders from South Asia and Mauritius to attend his swearing in ceremony in May 2014, India has strengthened and continued to build its ties with South Asian Association for Regional Cooperation (SAARC) nations. This year on May 5, India launched the “South Asia Satellite” with an aim to boost communication services and disaster support in the region. Except for Pakistan, which refused to participate in the project, the launch was cheered by all South Asian nations. The Modi government’s emphasis on regional connectivity is also manifest through a trilateral agreement with Iran and Afghanistan for the development of Chabahar port, as well as the launch of the Bangladesh-Bhutan-India-Nepal (BBIN) Transport Network. India’s relations with Bangladesh are better today than any time in the past; relations with Bhutan and Sri Lanka are also extremely good. The Modi government has made an agreement with Bangladesh for better connectivity between the northeastern states and the Indian mainland. Thus, bus routes linking Kolkata to Agartala and Shilong via Dhaka have started. Again with the exception of Pakistan, relations with which remain strained due to political and security reasons, India’s proactive diplomacy in the immediate neighborhood has been by and large successful. The Look East Policy, which has been an important facet of India’s foreign policy since the 1990s, was upgraded by the Modi government to Act East in 2014. This second pillar of Modi’s strategic geoeconomic vision is quite closely related to the first. Act East focuses on strengthening ties with the extended neighborhood, particularly in the Asia-Pacific region. Under the Modi government, India has strengthened strategic partnerships with countries like Vietnam, Malaysia, Japan, South Korea, Australia, and Singapore. The share of India’s bilateral trade with ASEAN countries is now almost 10 percent of India’s total trade. Connectivity is an important facet of Act East, just as it is for India’s neighborhood policy. The northeastern states are the gateways of land connectivity to Southeast Asia. However, poor infrastructure and insurgency have been hindrances to road connectivity in the region. Despite this, India’s trade with Myanmar through the northeast corridor has increased by 86 percent between 2013-14 and 2015-16. A third important pillar of the Modi government’s strategic geoeconomic vision – again, closely related to the first two – is the emphasis on India’s maritime role. Thus, the government has launched Sagarmala, a project that envisages developing a series of ports on both sides of India’s coast. The region has gained importance because of India’s location at the center of global maritime trade routes. India’s foreign policy in the Indian Ocean Region (IOR) received renewed impetus with the setting up of a separate IOR Division under the Ministry of External Affairs in January 2016. The Modi government has strengthened relations with Seychelles and Maldives and launched Project Mausam, a project with soft influence in the region. Thus, for the first time, a clear geoeconomic strategy is evolving in New Delhi that emphasizes the primacy of the IOR and India’s role as an Indian Ocean regional power. However, the glass is only half full, because the geoeconomic strategy needs to be supplemented by a clear strategic geopolitical vision. The Modi government has yet to do that. In the third year of its tenure, the Modi government faces some tough challenges: an unpredictable United States and an aggressive China, volatile U.S.-Russia relations, and closer Russia-China ties. In the 21st century, Indian policy has taken turns between bandwagoning with the United States and maintaining a balance between Washington and Beijing. It is time to assert India’s own role as a major player in international politics, and to lead rather than being led. To achieve this, it is very important to lay down a clear geopolitical strategy. It is also time for India to take a firm position on the political-military implications of China’s Belt and Road Initiative. When foreign policy is driven by the bureaucracy, it tends to be reactive. During the last couple of years, the Modi government has shown it has the political will to drive foreign policy. This has been reflected in India’s geoeconomic endeavors. If the government goes a step further, it can also reflect it its own vision for geopolitics. Uttara Sahasrabuddhe is Professor of International Relations in the University of Mumbai. Chaitanya Mallapur is a Mumbai-based foreign policy analyst. Foreign secretary S. Jaishankar suggests India should raise the level of its ambitions. India’s Plan to Jumpstart Its Maritime IndustryIndia’s Foreign Policy EvolutionIn India, Iranian Foreign Minister Discusses Sanctions, Crude Exports, and MoreThe Pakistan Factor in the 2019 Indian General ElectionsCan BIMSTEC Finally Become Relevant?